. : Optics & Photonics Focus :: Two Colors is Better than One :. The rhythmic beat of the heart keeps us alive. This beat is the result of an electrical mechanism, ingeniously put in place by nature, to control its cells. Surprisingly, ultrashort light pulses can do the same, virtually making these cells dance to the tune of light. Subtle quantum effects will be at the heart of the quantum computers of the future. Very few existing setups, however, offer the necessary stability and control to exploit such effects at the moment. Arrays of waveguides meet this challenge. This year the world celebrates the 50th birthday of the laser through an initiative jointly organized by various optics and photonics organizations: the LaserFest. Happy birthday laser! Standard optical fibers have revolutionized our lives. Now new perspectives can be envisioned for a new generation of photonic crystal fibers capable of transmitting two different colors at the same time. A hollow-core photonic crystal fiber (PCF). Scanning electron microscope (SEM) image of the cross-section of a hollow-core PCF. Most of the light is transmitted in the hollow-core. What do Youtube and non-invasive endoscopic surgery have in common? The answer to this question is worth a Nobel prize. More precisely, the 2009 Nobel Prize in Physics, which has been awarded to Charles K. Kao "for groundbreaking achievements concerning the transmission of light in fibers for optical communication." In just a few decades optical fibers have managed to change nearly all aspects of our lives. Now, the group led by Fetah Benabid at the University of Bath in UK has demonstrated that a fine-tailored kind of photonic crystal fibers can guide the light of two different colors at the same time, which may prove useful for future applications. The power of an optical fiber lays in its ability to transport light for long distances — in much the same way as a pipe can transport water. In a standard optical fiber the light propagates in a flexible glass cylinder, the length of which can be several kilometers and the diameter is a maximum of a few microns. The glass tube is surrounded by a lower refractive index material that prevents the light from escaping thanks to a phenomenon known as total internal reflection (TIR): it is just like having a whole set of mirrors surrounding the fiber’s core, because the jump between the high-refractive-index material (core) and the low-refractive-index material (cladding) works as a unidirectional mirror. In this way the optical fiber can deliver the light to just where we need it. Standard fibers are a terrific technological achievement and work tremendously well in most applications. However, standard optical fibers present some downsides. Namely, the glass where the light propagates unavoidably absorbs some of the light, which leads to losses and limits the maximum power that can be transmitted without melting the fiber. Furthermore, the different colors that compose a single light pulse travel with slightly different speeds, and therefore reach their destination at different times, a phenomenon known as dispersion. Various novel kinds of fiber have been proposed over the years in order to address such problems. 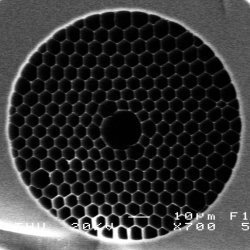 Particularly successful have been those known as hollow-core photonic crystal fibers (PCF). In such fibers the light propagates in an air tube. As a consequence most of the problems disappear since in air there are nearly no losses, much higher powers can be transmitted, and there is no dispersion. Is this the Holy Grail of optical fibers? Unfortunately not! New problems arise since creating an air tube is not as easy as creating a glass tube. Light cannot be confined in air by TIR, because no material has a refractive index lower than air. Luckily, it is possible to obviate this problem by using a different mechanism to confine the light. This is achieved by placing a photonic crystal around the core, which is a kind of honeycomb structure where glass and air alternate and can then reflect light. Different to the refractive index mismatch in standard optical fibers, the photonic crystal structure works well only for a certain range of colors, which are known as a bandgap. Therefore such hollow-core PCF can only be used for transmitting light of one color — say the near-infrared colors around wavelength 1064 nm. The breakthrough of Benabid’s group consists in having conceived and experimentally demonstrated a way of having two bandgaps in the same fiber, allowing therefore for the transmission of light of two different colors. "We managed to have a clear physical understanding of how the guided mode and the cladding interact with each other," explains Benabid. This permitted Benadib’s group to fine-tune the shape of the photonic crystal structure that surrounds the core in order to obtain not only one, but two bandgaps, and to therefore transmit light of two different colors. The fibers already fabricated can guide light at 1064 nm and 1550 nm. "This is extremely important because most of the labs and industries use laser at these wavelengths," remarks Benadib, "and they actually want to transport them and guide them simultaneously. And hollow-core fibers can actually be used to do that." Other possible applications include applications to non-linear optics, to sensing, and to atom optics. "We have also been working to fill the fibers with gas." This can be used to detect the gas through its spectroscopic signature, but also it can also be used to build a new kind of lasers, known as photonic micro cells. In general, they can be applied in all those experimental situations where a pump laser and a probe laser are needed. Alexander Gaeta from Cornell University (Ithaca, NY, USA) agrees that the possibility of using these new hollow-core PCF can create new experimental possibilities. "In the nearest term the application would be non-linear optics," says Gaeta, "but they could also be useful in all those cases where two pulses need to be delivered together." Philip S. Light, François Couny, Ying Ying Wang, Natalie V. Wheeler, P. John Roberts & Fetah Benabid, Double photonic bandgap hollow-core photonic crystal fiber, Optics Express (2009) 17, 16238-1624 (link).